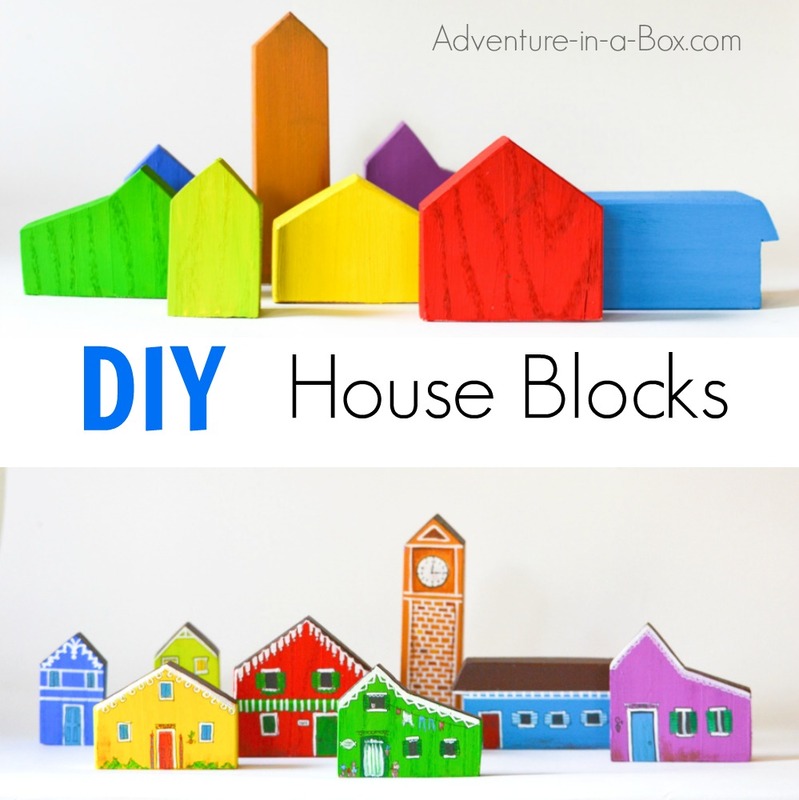 Make a set of DIY house wooden blocks for kids. 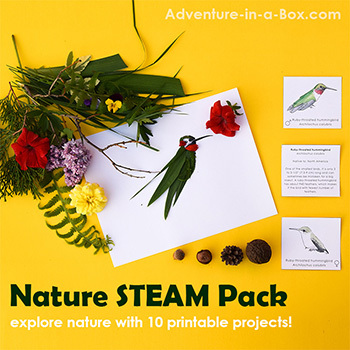 It’s a great addition to railroads, cars and other imaginary play activities! 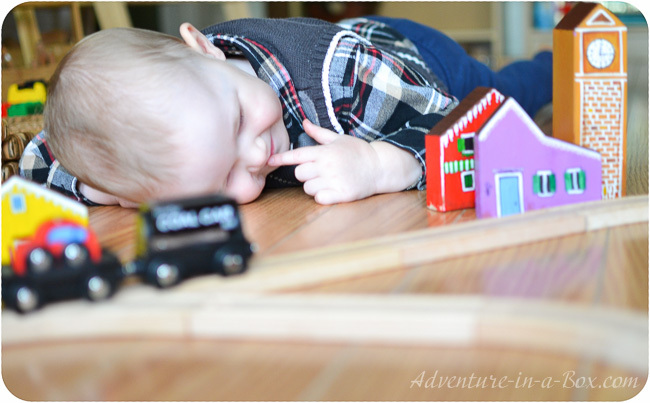 Railroads have stretched across our playroom, and along them run the trains, guided by the confident hand of a two-year-old engineer. To enhance the fun of construction, we decided to add some handmade house blocks to the railway set. Railway sets are often sold with some buildings, but none of ours did. First, we got a little IKEA set , and it was a very good introduction to the fun of railway building. 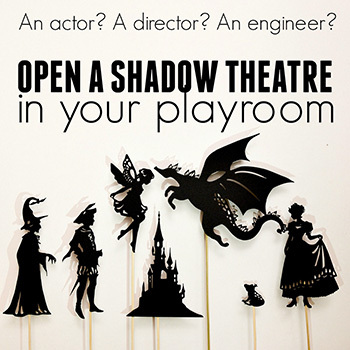 Entertaining, but not overwhelming for a toddler. Then, we decided to add more pieces and mixed our first set with Orbrium Train Tracks . They had unique multi-level tracks, but still did not come with any houses. 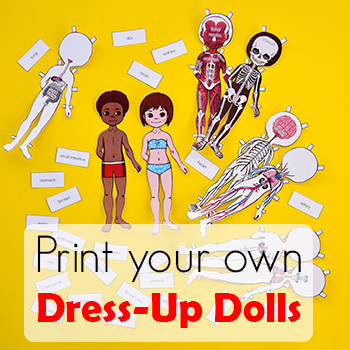 It was just as well: it presented the possibility for us, parents, to make a fun little craft. 1. Mark the shapes of the houses on the board. 2. Cut them out. Start by cutting the angles, then separate that houses from the board. Sand the edges smooth. At this point, Budster was ready to play. Why not? These unfinished houses would make for a perfect set of Waldorf house blocks, and you can leave them like that. 3. Paint the houses in solid colours. Let them dry and paint the roofs. Add the doors, windows and any details you like. You may want to put some signs on the doors: I had one “cafe” (red) and one “flower shop” (green). 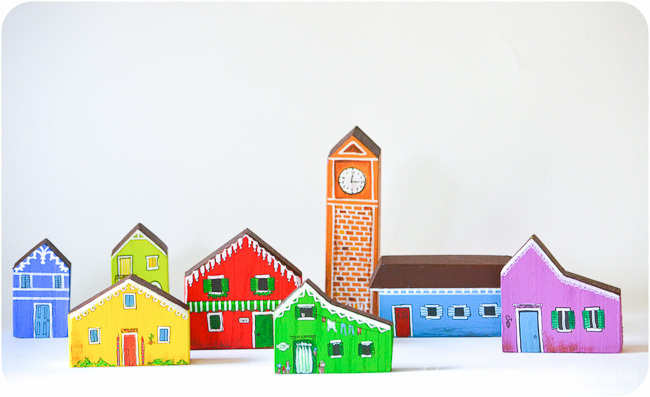 Older children can join painting on the blocks and make their own city! Now, for a little bit of a personal story. While my choice of colours may seem suitable for a toy, it is not an ordinary colour scheme for a neighbourhood. Yet, I based my little town on a real place! Three years ago my husband and I travelled to Italy. I did not feel that it would be right to leave Italy without seeing Venice, and that was where we headed at the end of our two-week stay. 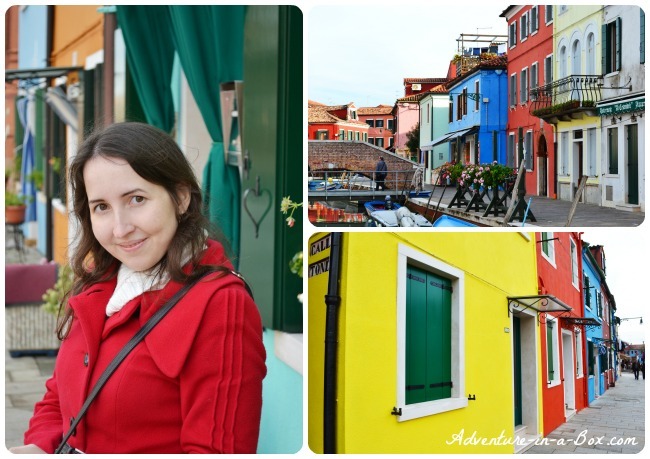 From Venice we took a boat to a small island called Burano, and what a joyfully coloured place it turned out to be! Every house was painted in a bright colour, and it gave the town a very unique look. I loved that island. It was interesting to know that the colours of the houses follow a specific system, and if someone wishes to paint their house, they must send a request to the municipality, then receive a list of the colours permitted for that lot. So I painted the house blocks for Budster and looked at our photos from Italy, getting ideas for decorations. I may not see the brightly coloured little island again, but Budster and I will have a little Burano-inspired town of our own. If Budster was curious about the houses in their unfinished state, he could not wait to play with them once they were painted. I had to remind him over and over again, “They need to dry a little longer.” That being said, acrylic paints dry within approximately ten minutes, but it must have seemed like eternity to Budster. Finally, he got them and went on building the town and then a railroad around it. 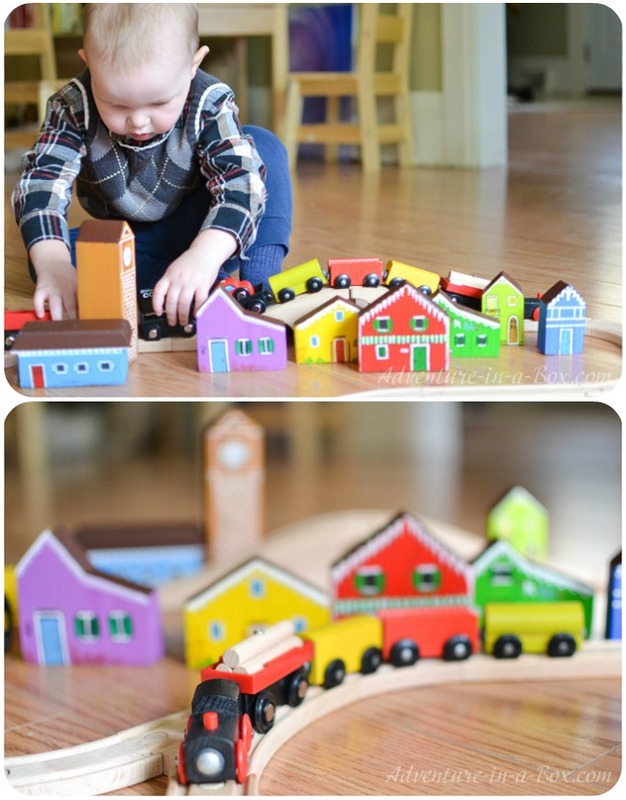 Budster loves playing with his railroad, and little houses added an interesting interactive element to his play. Now trains can go from one place to another. 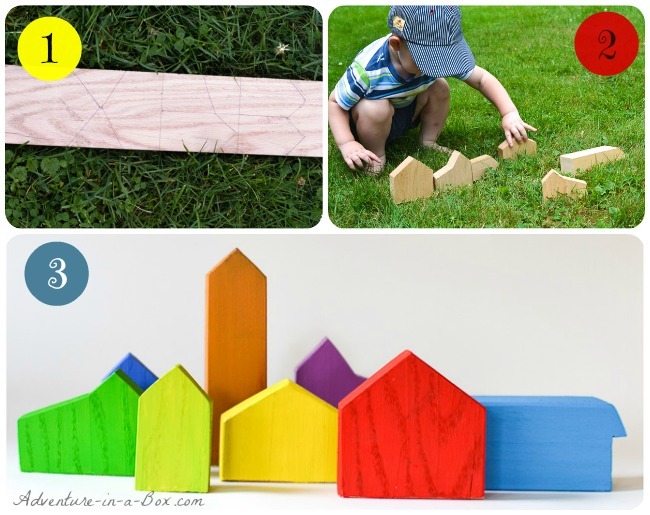 Because of the colourful appearance, the houses help Budster practice the names of colours, which is something he is very interested in lately. He has also invented his own game for the house set. He takes a little man from his Lego set and hides him behind one of the houses. A few seconds later he finds him and sings, “Peek-a-boo!” He is delighted when someone else joins this game to hide a little man or two for him. If you could base your wooden city on any real city, which would would you choose? I cant say enough how much I adore this set. 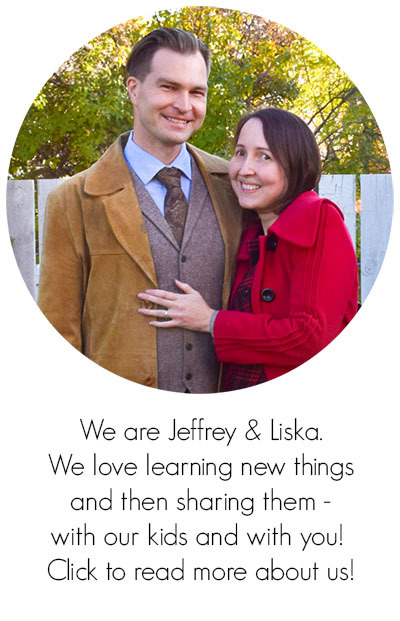 IT’s beautiful and the story behind the colors…. oh that’s just priceless toy. Beautiful!